Torsten has recently been working on preparing and running Docker-containers for the scenery toolchain. The jenkins server responsible for maintaining the terrasync data at https://scenery.flightgear.org/jenkins/ already does some tasks within containers. The jenkins instance itself will move into a container soon. Torsten also created a Docker image for terragear to make its usage a lot easier. The short term goal is to get all the tools required to run the scenemodels database with its web frontend, the terrasync upstream data maintenance into containers, hoping to be able to run this entire chain at any public or private cloud. A mid term goal might be to have terragear running from Jenkins on automatically-provisioned virtual machines whenever a new scenery set needs to be rebuilt. There is still a lot to do before this becomes reality and a docker swarm or kubernetes cluster generates scenery for us regulary. Torsten has sucessfully created the elevation data from SRTM1/3 for the entire globe and created a few random airports with this image. Currently, he is playing with integrating ogr-decode. The docker image gets automatically built, including building latest simgear & terragear from GIT. This build process runs directly at the docker hub: https://hub.docker.com/r/flightgear/terragear/builds/ (Yes: docker hub compiles simgear and terragear for us, amazing, isn't it?) Torsten hopes to be able to compile the a first chunk of scenery within the next couple of weeks. That means, if someone wants to generate scenery in the future they will simply be able to download the latest docker image, start it up on Docker CE and run the commands. No compilation required. 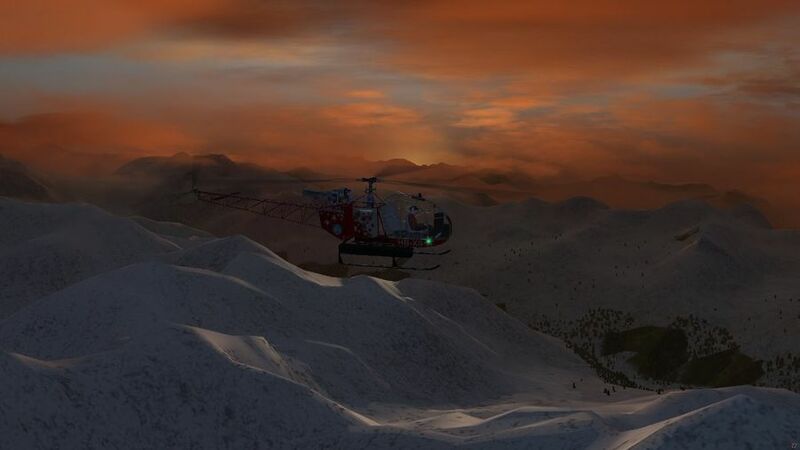 Which is quite amazing, and could massively reduce the effort required to work on scenery. rleibner's new Oscilloscope addon is working.This screenshot shows the usual c172p "magnetos checking" Channel 1 (yellow) is rpm (100 rpm / div).Channel 2 (mauve) is magnetos (1 / div).Time sweep is 200 ms / div.The idea is to share it as an addon. Mainly to have some feedback about plot2D/graph. skinnable.nas to create Canvas GUI dialogs including multiple clickable layers. graph.nas to create various types of Canvas instruments. plot2D.nas the very basic Canvas helpers. 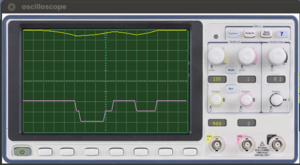 But apart from that, the oscilloscope itself may be an useful tool for developers and coders. Although I do not know any aircraft that has this instrument in its panel, the on-board engineer will eventually appreciate having it on hand at some point. 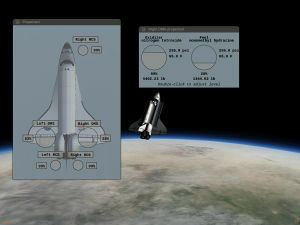 An example of the detail dialog which allows to set levels of fuel and oxidizer separately (and the overview dialog shows the usable propellant then, i.e. the minimum of the two) - for aircraft, this would be somewhat simpler. Some of you may already know that the current tool to generate the dialogs (PUI) is going to disappear in the mid-future. After some (partially controversial) discussion, there seems now to be some support for the idea that canvas is a good tool to generate aircraft-specific dialogs in the future (as it allows to tailor the dialog closely to the plane and also, canvas being canvas, the UI can smoothly mesh with the 3d models, so you can project a canvas checklist onto a 3d model in sim for instance rather than a popup window). 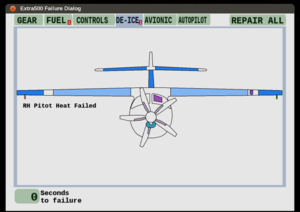 Thorsten would very much like to claim to be pioneering this approach, but in fact he believes the Extra-500 team is - look at the failure dialog of that plane where you can click the components you want to fail and you see what he means! Anyway, Thorsten has started to roll out a few designs of his own and try to keep the tools fairly general so that they can be re-used by others- so here's the revised version of the Shuttle propellant dialog. Using Richard's Emesary IPC frame to link between the MFD and underlying simulation state. This should make it easy to run the MFD on a separate FG instance, and provides a good demarkation between the individual aircraft systems and the FG1000 itself. Create various underlying classes to support UI features - highlighting, editing. The idea here is that one can create the UI as an SVG file, and these are used to control it. For an example of this in use, see the Airport Information page. Press the CRSR knob to create a cursor on the ICAO airport ID, then use the inside FMS knob to start editing the ID. This should make creating most of the rest of the pages far easier. See Canvas MFD Framework for details of the elements now supported. There's still a huge number of pages to write, and the pages around route planning will likely be particular "fun", but it should be far faster now these blocks are in place. The FG1000 wiki page shows the pages that have been created so far (4 out of 28!). Stuart is pretty happy with the overall architecture now, so if anyone wants to create some of the pages they are very welcome to do so! Use the inner FMS knob (mouse wheel on the FMS knob on the bottom right) to navigate through the pages within the group. To moved around the page, click on the FMS knob, and then use the FMS knob to navigate around the page. Press ENT when any frequency is highlighted to load it into the standby frequency of the NAV/COM. FlightGear now provides better GPWS support for Airbus aircraft - the unit which triggers voice alerts like "Pull up!" and altitude callouts ...50-40-30-20-10. 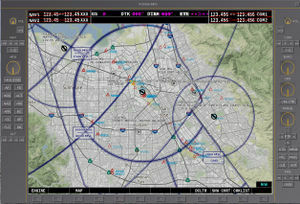 The original FlightGear GPWS implementation was made to exactly match all details of a specific real-world hardware unit. The specific unit was never intended to be installed on Airbus aircraft, hence, so far lacked the Airbus-specific warnings and callouts. Starting with FG2018.1, the FlightGear GPWS unit was extended with optional support for Airbus callouts. 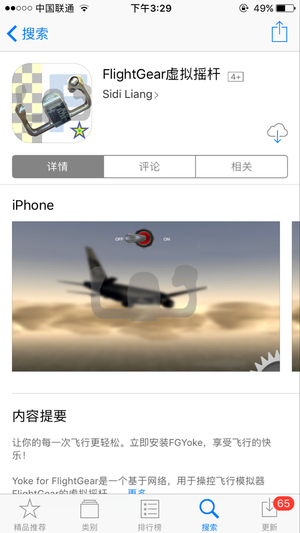 The short description of how to enable the Airbus mode is: set the "category-4" configuation value in the "mk-viii" section of the aircraft's "...-set.xml" file to "1000". The long and detailed description is: read the Wiki page. :-) You can also improve the realism of the unit by providing more realistic Airbus-style voice samples (.wav files). So, what's different with an Airbus GPWS then? While some callouts may depend on an airline's company policy, there's usually several voice alerts specific to Airbus, which are not to be heard on a Boeing aircraft. 2500! : When landing with an Airbus, you'll hear the first GPWS altitude announcement earlier - starting with an early "2500" callout when descending below 2500ft. Hundred above! : An additional "Hundred above!" callout is issued at 100ft above the selected decision height. The decision height is the altitude where the crew needs to make their final decision whether to continue with the approach or whether they need to abort due to bad visibility. The "Hundred above!" callout gives an Airbus crew some extra time to make up their minds. Seconds later, the actual decision height is then announced by the "Minimums!" callout - which is also common with Boeing and many other aircraft. If you want to participate in the screenshot contest of February 2018, you can submit your candidate to this forum topic. Be sure to see the first post for participation rules. For purposes of convenience and organization, after all the entries have been submitted, a new forum topic will be started containing all shots in an easy-to-view layout. The voting will then take place there. Once the voting has finished, the best screenshot will be presented in the Newsletter edition of February 2018. 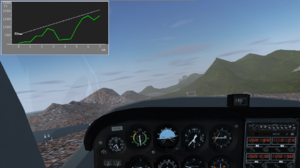 Thanks for reading FlightGear Newsletter January 2018! ↑ Torsten Dreyer (Jan 27th, 2018). [Flightgear-devel] Making containers fly: FlightGear scenery goes docker . ↑ Torsten Dreyer (Jan 30th, 2018). Re: [Flightgear-devel] Making containers fly: FlightGear scenery goes docker . ↑ Stuart Buchanan (Jan 30th, 2018). Re: [Flightgear-devel] Making containers fly: FlightGear scenery goes docker . ↑ rleibner (Jan 6th, 2018). Re: Plot2D and graph helpers . ↑ Thorsten (Jan 24th, 2018). Aircraft-specific dialogs . ↑ Stuart Buchanan (Jan 5th, 2018). 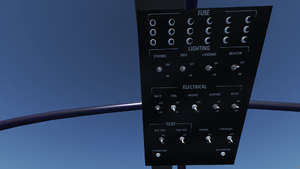 Re: [Flightgear-devel] FG1000 Status Update . ↑ stuart (Jan 14th, 2018). Re: Canvas G1000 . This page was last modified on 3 February 2018, at 10:18.